Students and KSB Meet and Greet. 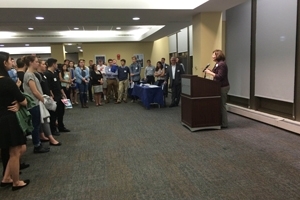 Every October, American University’s Kogod School of Business hosts a faculty "Meet and Greet." It's an opportunity for first-year college students to put professors names with faces and hear first-hand about each professors’ classes. "I remember when I was a freshman, this [event] is where I learned what I wanted to do" said Alexandra Zeiger, President of the Undergraduate Business Association (UBA) and current upperclassman at Kogod. A professor from each Kogod major, spoke briefly on what it means to study within their department. Each representative emphasized the ability that each student has to choose from some of the most highly demanded courses in the country. As the room continued to fill up with Kogod students, Emma Reeves, a first year undergraduate student, said, "I was intrigued to learn whatever possibilities Kogod may have for me. Now I can speak one-on-one with these professors to help clarify and find more of what I want." Kogod departments and majors include Information Technology, Accounting and Taxation, Marketing, Finance and Real Estate, International Business, Management, Business and Entertainment and Entrepreneurship. Other academic programs such as AU Abroad, Kogod Center for Career Development (KCCD), Kogod Academic Advisors, and K-LAB were also in attendance to provide information on additional support for first year students. The Kogod faculty "Meet and Greet" is an opportunity for Kogod students to dive deeper and take advantage of what Kogod has to offer. "You chart your own course. What are you going to do? How are you going to get there? Our students are getting interviews and charting their own course. You can too," said Professor Sheila Bedford from the Department of Accounting and Taxation.